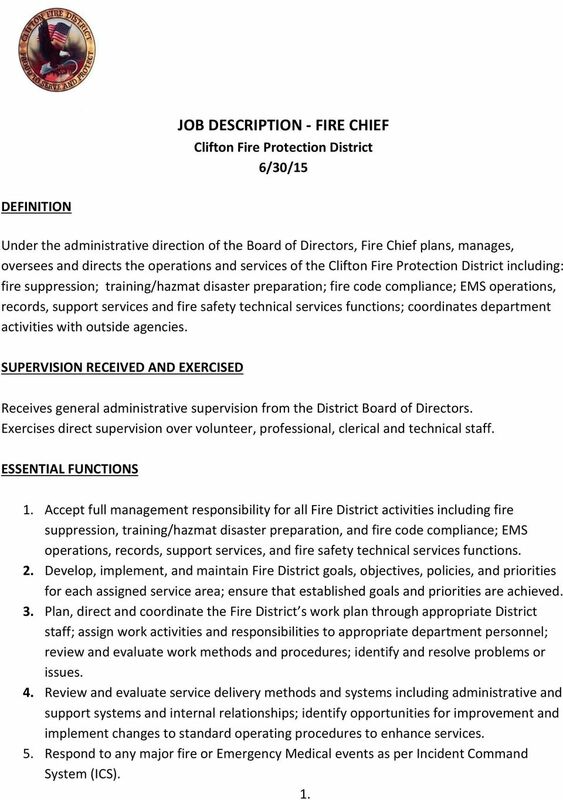 Download "JOB DESCRIPTION FIRE CHIEF"
1 JOB DESCRIPTION FIRE CHIEF Clifton Fire Protection District 6/30/15 DEFINITION Under the administrative direction of the Board of Directors, Fire Chief plans, manages, oversees and directs the operations and services of the Clifton Fire Protection District including: fire suppression; training/hazmat disaster preparation; fire code compliance; EMS operations, records, support services and fire safety technical services functions; coordinates department activities with outside agencies. SUPERVISION RECEIVED AND EXERCISED Receives general administrative supervision from the District Board of Directors. Exercises direct supervision over volunteer, professional, clerical and technical staff. ESSENTIAL FUNCTIONS 1. Accept full management responsibility for all Fire District activities including fire suppression, training/hazmat disaster preparation, and fire code compliance; EMS operations, records, support services, and fire safety technical services functions. 2. Develop, implement, and maintain Fire District goals, objectives, policies, and priorities for each assigned service area; ensure that established goals and priorities are achieved. 3. 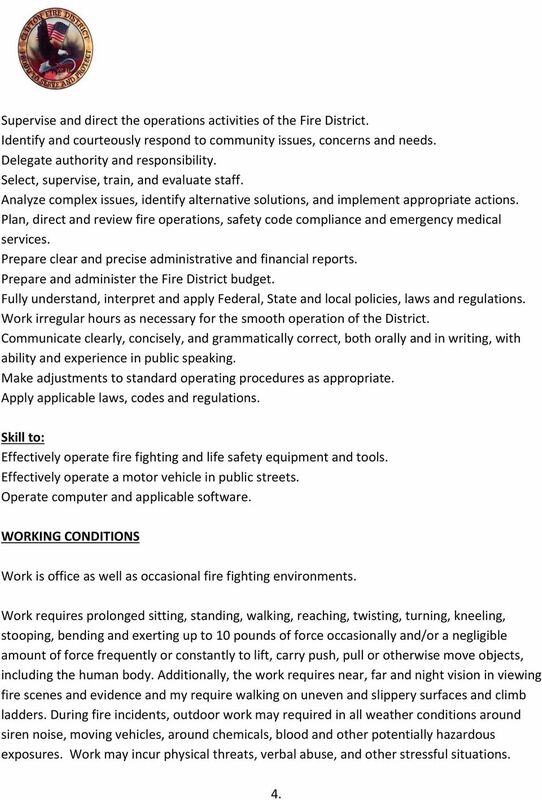 Plan, direct and coordinate the Fire District s work plan through appropriate District staff; assign work activities and responsibilities to appropriate department personnel; review and evaluate work methods and procedures; identify and resolve problems or issues. 4. Review and evaluate service delivery methods and systems including administrative and support systems and internal relationships; identify opportunities for improvement and implement changes to standard operating procedures to enhance services. 5. Respond to any major fire or Emergency Medical events as per Incident Command System (ICS). 1. 2 6. Oversee the selection, training, and evaluation programs of all Fire District personnel; provide or coordinate staff training; identify and resolve staff deficiencies; execute discipline and termination procedures. 7. Manage, develop, oversee the Fire District s annual budget; monitor and approve Expenditures; monitor and approve payroll; present updates to Board at each monthly meeting. 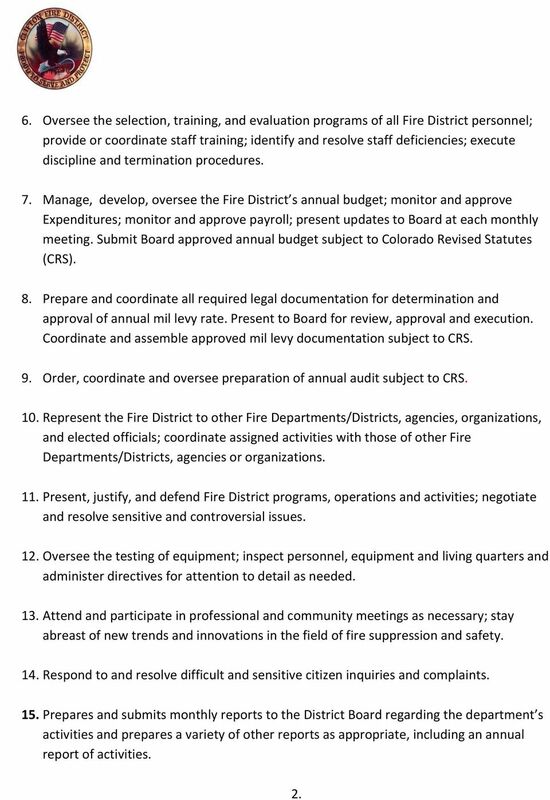 Submit Board approved annual budget subject to Colorado Revised Statutes (CRS). 8. Prepare and coordinate all required legal documentation for determination and approval of annual mil levy rate. Present to Board for review, approval and execution. Coordinate and assemble approved mil levy documentation subject to CRS. 9. Order, coordinate and oversee preparation of annual audit subject to CRS. 10. Represent the Fire District to other Fire Departments/Districts, agencies, organizations, and elected officials; coordinate assigned activities with those of other Fire Departments/Districts, agencies or organizations. 11. Present, justify, and defend Fire District programs, operations and activities; negotiate and resolve sensitive and controversial issues. 12. Oversee the testing of equipment; inspect personnel, equipment and living quarters and administer directives for attention to detail as needed. 13. Attend and participate in professional and community meetings as necessary; stay abreast of new trends and innovations in the field of fire suppression and safety. 14. Respond to and resolve difficult and sensitive citizen inquiries and complaints. 15. Prepares and submits monthly reports to the District Board regarding the department s activities and prepares a variety of other reports as appropriate, including an annual report of activities. 2. 3 16. Perform other related duties as required. QUALIFICATIONS Education (minimum requirement) A Bachelor s Degree, or equivalent, from an accredited college or university with major course work in fire science, public administration or a related field of study required. Experience (minimum requirements) Ten (10) years of increasingly responsible fire suppression and prevention experience including five (5) years experience as a chief officer (Battalion, Operations, or Assistant) with management and administrative responsibility. 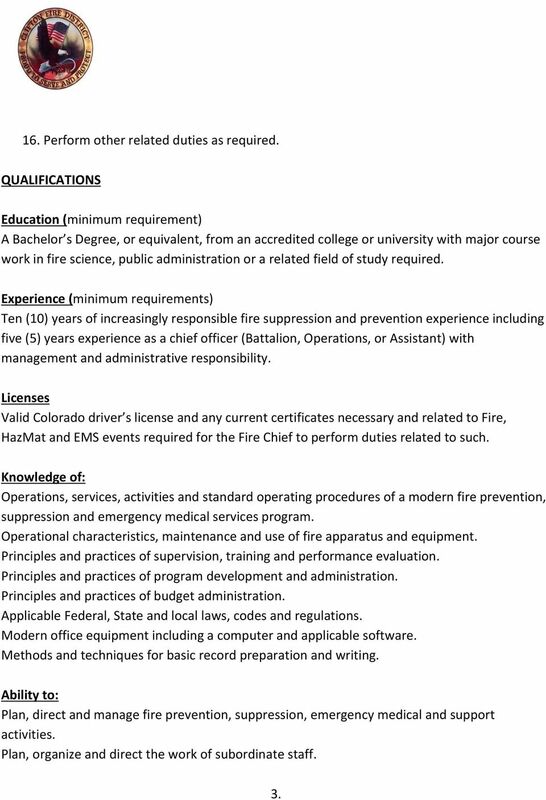 Licenses Valid Colorado driver s license and any current certificates necessary and related to Fire, HazMat and EMS events required for the Fire Chief to perform duties related to such. Knowledge of: Operations, services, activities and standard operating procedures of a modern fire prevention, suppression and emergency medical services program. Operational characteristics, maintenance and use of fire apparatus and equipment. Principles and practices of supervision, training and performance evaluation. Principles and practices of program development and administration. Principles and practices of budget administration. Applicable Federal, State and local laws, codes and regulations. Modern office equipment including a computer and applicable software. Methods and techniques for basic record preparation and writing. Ability to: Plan, direct and manage fire prevention, suppression, emergency medical and support activities. Plan, organize and direct the work of subordinate staff. 3. 4 Supervise and direct the operations activities of the Fire District. Identify and courteously respond to community issues, concerns and needs. Delegate authority and responsibility. Select, supervise, train, and evaluate staff. Analyze complex issues, identify alternative solutions, and implement appropriate actions. Plan, direct and review fire operations, safety code compliance and emergency medical services. Prepare clear and precise administrative and financial reports. Prepare and administer the Fire District budget. Fully understand, interpret and apply Federal, State and local policies, laws and regulations. Work irregular hours as necessary for the smooth operation of the District. Communicate clearly, concisely, and grammatically correct, both orally and in writing, with ability and experience in public speaking. Make adjustments to standard operating procedures as appropriate. Apply applicable laws, codes and regulations. Skill to: Effectively operate fire fighting and life safety equipment and tools. Effectively operate a motor vehicle in public streets. Operate computer and applicable software. WORKING CONDITIONS Work is office as well as occasional fire fighting environments. Work requires prolonged sitting, standing, walking, reaching, twisting, turning, kneeling, stooping, bending and exerting up to 10 pounds of force occasionally and/or a negligible amount of force frequently or constantly to lift, carry push, pull or otherwise move objects, including the human body. Additionally, the work requires near, far and night vision in viewing fire scenes and evidence and my require walking on uneven and slippery surfaces and climb ladders. During fire incidents, outdoor work may required in all weather conditions around siren noise, moving vehicles, around chemicals, blood and other potentially hazardous exposures. Work may incur physical threats, verbal abuse, and other stressful situations. 4. 5 GENERAL TERMS APPLICABLE TO THIS POSITION A. Employed At Will. This job position is at will, meaning that either the employee or the District may terminate the employment relationship at any time, with or without cause or prior notice. B. Not a Contract. This job description is not a contract of employment and is subject to change by the District at any time without prior notice to employee. C. Duties Not Inclusive. The duties listed above are examples of essential functions of the job position but are not all inclusive. The District may require the employee to perform additional duties not listed and may modify the duties listed. D. Handbook. 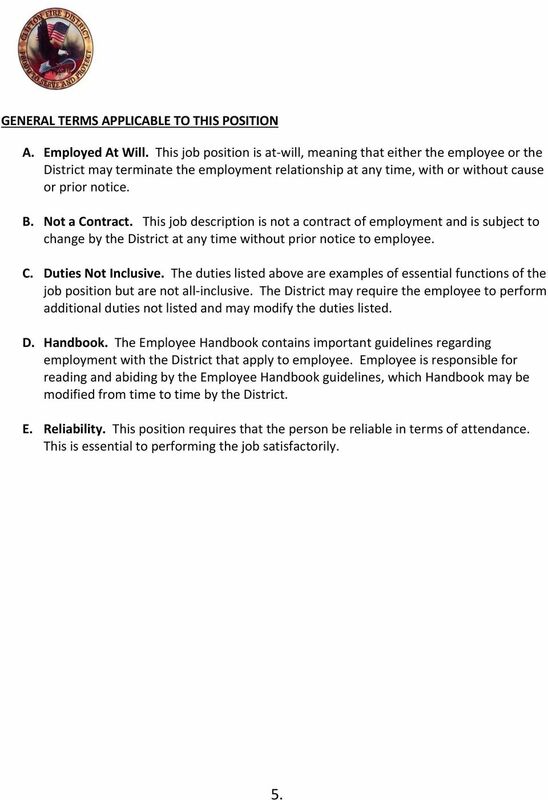 The Employee Handbook contains important guidelines regarding employment with the District that apply to employee. Employee is responsible for reading and abiding by the Employee Handbook guidelines, which Handbook may be modified from time to time by the District. E. Reliability. This position requires that the person be reliable in terms of attendance. This is essential to performing the job satisfactorily. 5.